The ASPS professional dance board has upgraded features over our standard dance board that includes: 1. Extra heavy duty frame for better sound quality. 2. Top deck is 100% defect free high grade top deck. 3. Fully sealed joints. 4. About the same weight as our standard board. 5. Lots of extra screws in the top deck for stiffer better sounding board. 6. Extra long /strong end cap screws for stiffer frame and better sound. 7. Rounded carry handle for better comfort. 8. 1/16 in tolerance or better on all joints. 9. Smooth sanded frame 10. Standard 4x4 rubber grips - give extra cushion, reduces movement on the floor, and protects the floor from any kind of scuffing. This portable raised 24 x 32 in dance boards are normally used for clogging, flat-footing, or buck dancing. This is our higher quality dance board suitable for use for concert performances, professional dancers, or anyone seeking higher sound quality. Options------------------------------------------------------------------ Features----------------------------------------------------------------- Raised Height - you want a dance board raised off the ground a little bit for several reasons. One reason is to give the board a little more of the deeper base sound that makes you sound good. Another reason is to keep the board dry if you dance outside on in a grassy area like many people do when they go to fiddle conventions or festivals. You don't want the back side of your board getting muddy or wet as it will warp and make the board sound dull. Handle - Fully integrated handle does not protrude in a way which will dent or scuff your other items you might be carrying in your car. Modular - This board is designed to work with others just like it. 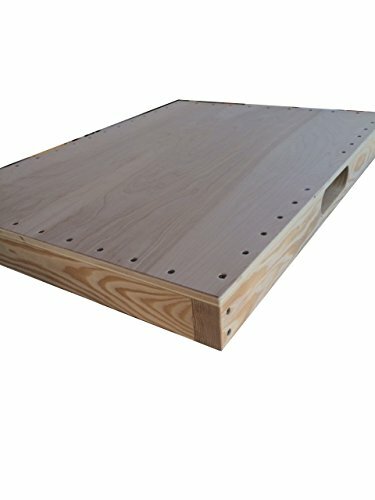 This means each one of your friends can buy a board like this and when you come together you can put them all together to make a much larger dance surface. If you have any questions about this product by ASPS, contact us by completing and submitting the form below. If you are looking for a specif part number, please include it with your message.